EB Expo 2012 second annual gathering bought out the best in the cosplay community with the annual Cosplay Evolved competition. Of the entries received, EB Games whittled down the entrants to a handful of finalists who performed their skits on stage in front of a live audience in Sydney. 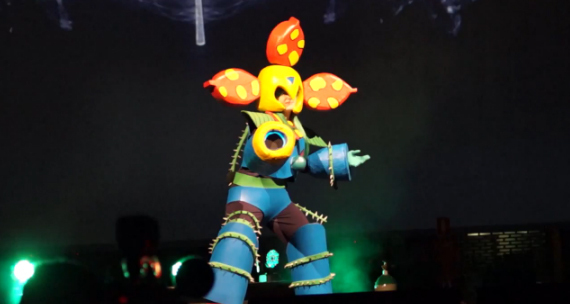 Although last year’s first place went to a Mass Effect group effort, this year’s Cosplay Evolved honour went to an individual – Lucy Posner (Mittenkitten) for her home-made Plant Man costume tribute to one of Mega Man’s most colourful foes. We had a chance to catch-up with Lucy to learn a bit more about her cosplay involvement; and the level of dedication and detail invested in bringing the often misunderstood Plant Man to life. Hangie: Tell us a little bit about yourself, such as who you are, your interests and how long you’ve been involved in the cosplay scene. Lucy: I’m Lucy, and I go by Mittens in the cosplay community. I’ve been cosplaying for about six years now, and I’ve loved every moment of it! Outside of cosplay, I’ve just finished a Bachelor of Game Design at the Queensland College of Art with a focus on games narrative, I’m a renaissance fencer and I do improvised comedy (‘theatresports’) for fun as well as some professional acting with St Luke’s Theatre Company in Brisbane. I’ve been playing games from an early age, from board games to collectible card games to video games to roleplaying games, and found out about the conventions by accident in high school! I’ve been attending conventions ever since, and would definitely consider cosplay to be one of my favourite hobbies. Hangie: What is the best aspect of cosplaying, and what made you want to get into cosplaying to begin with? Another thing that I love about cosplay is the fact that it’s showing appreciation for characters that I love and simultaneously teaching me new skills about costume creation. If you want it to be, cosplay can be an ever-changing hobby that constantly challenges you in the best kind of way. There’s no better way to learn than to do, so I’ve always tried to choose characters that I think will teach me new things throughout the construction process. If somebody comes up and compliments your costume, it’s an excuse to get talking! For me, sharing the things that I’ve learned about making costumes is very important. If somebody respects my costuming skills enough to ask how I made something, it’s one of the biggest compliments I can receive! I started cosplaying when I was fifteen. I heard about the pop culture conventions from a school friend, and was thrilled to find out that there were events that catered to people like me! 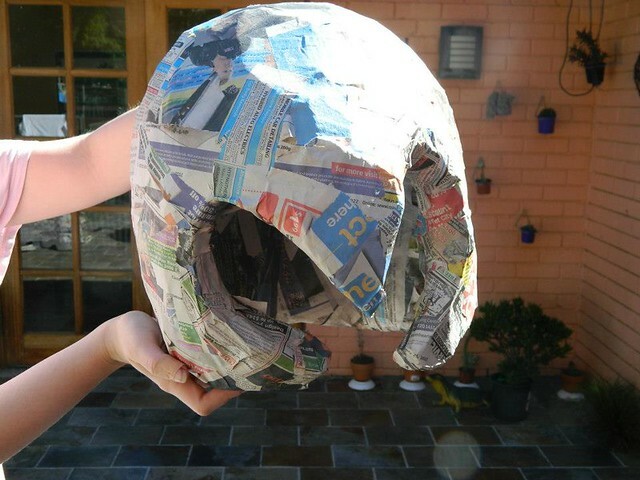 My very first costume was a few strips of fabric glued onto a jacket that I wasn’t very proud of, so I decided over the school holidays that I’d try and teach myself more about making props (since at the time I’d never touched a sewing machine in my life). I ended up making Demyx’s sitar from Kingdom Hearts II and my group of friends won ‘Best Group’ at Supanova that year, and I haven’t looked back since! I suppose I’m quite well known in the Brisbane cosplay community for my skits and cosplay performances, which is another facet of cosplaying that I really love. Considering that cosplay is a portmanteau of the words ‘costume’ and ‘roleplay,’ I’ve always really found that getting up onstage and getting the audience to laugh at the jokes I make in my performances is truly in the spirit of the event; I’m still surprised that some of my corny puns actually get laughs! 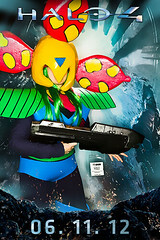 Hangie: Cosplaying as a Megaman 6 villian is certainly not the most popular choice for cosplayers. What made you decide to pay homage to a less than popular Capcom “baddie”? Lucy: Haha, yes. 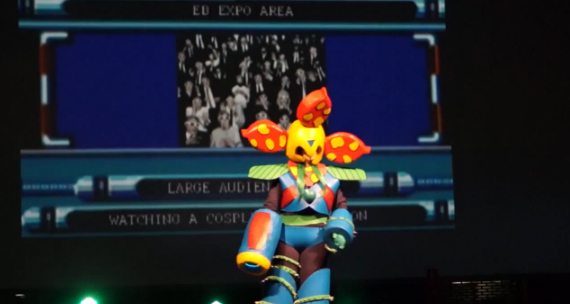 Plantman was certainly one of my more esoteric costumes! I’ve really loved the character designs throughout the Megaman series’ from a young age, and I was browsing through the annuls a few months ago when I came across a picture of Plantman. My first thought was ‘Gosh, he’s so flamboyant! I’d love to try and make that costume!” and it sort of snowballed from there. Hangie: How did you go about designing and creating your costume, and what was the hardest aspect of putting it all together? Lucy: The first thing I always try and do is find as many reference pictures as possible of the character that I’m cosplaying as. Unfortunately there are only about five pictures of Plantman in existence, so I had to guess and sketch up how I thought the back of his costume would look. The next step is to look online and see if I can find similar costumes that other people have constructed that I can take reference from, then it’s gradual steps of building and re-building until I’m happy with how the costume turns out. I always try to give myself more than enough time to construct my costumes so I don’t end up rushing at the end; Plantman took four or five months to construct because a lot of the techniques were new to me, and even then I was still panicking two days before the convention about getting my shoes dry! Quite a bit of Plantman is made out of unconventional materials that I didn’t expect to turn out as well as they did; a lot of the armour was either made out of expanding foam covered in papier mache, stacks of packing foam glued into place and covered with spraypainted thin foam, or camping mats hot-glued into shape and painted! 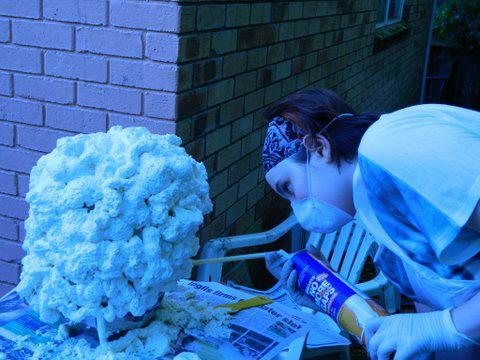 I ended up using a lot of foam in the construction of Plantman, haha. The vines were a lot of fun; initially I was dreading the idea of having to hand-shape over 150 (by my estimate) small cones for the thorns on his vines, but then I came up with the idea of spray-painting incense cones and it worked perfectly! There was some trial and error involved with Plantman; I ended up scrapping two shoe builds and at least two prototype helmets because they weren’t working, but that’s all part of the experience and I certainly know how to make everything much better next time around! 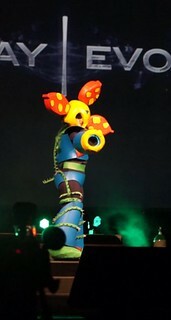 Hangie: You were certainly a hit with the audience during the Cosplay Evolved skit. 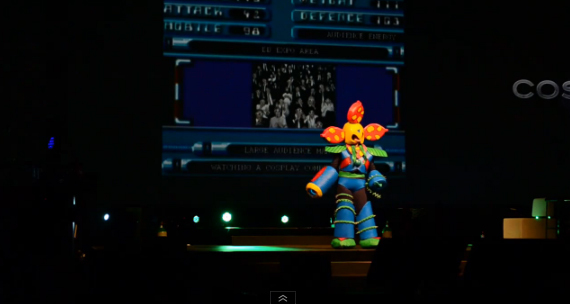 Were you expecting this sort of reaction from the audience and other cosplayers? Lucy: Thankyou! I certainly wasn’t expecting such a strong reaction, no. I’ve almost always written comedy skits for my performances, and go up onstage with the philosophy “If the audience laughs once, I’ll be really happy.” Hearing so much laughter was amazing, and the reception blew me out of the water! I was completely blown away by the calibre of the other entrants as well; everybody’s costumes were so impressive and they were such lovely people when I was talking to them backstage. In all honesty, I wasn’t expecting to place. I was just proud that I had been given the opportunity to compete in such a strong group of finalists. It was an incredibly tough competition, and I’m still trying to come to grips with the fact that I won! Hangie: What was it like getting up on stage in front of thousand of fans to perform your Cosplay Evolved skit? Lucy: It was certainly very nerve-wracking. For me, the worst bit of the competition is the wait just before you go onstage. I always get incredibly worried and panicked, but as soon as I’m onstage I just try to enjoy myself and make sure the audience has a great time. Once I was onstage, all my nerves vanished. Going last made me incredibly nervous because all the other contestants were such strong performers, but at the end of the day I just wanted to get up there and have a good time regardless. A highlight of my time onstage was reducing John Robertson (the host) to hysterical laughter; I didn’t think that my nose being crushed by my helmet was that funny, but evidently it was! Hangie: Placing first in Cosplay Evolved has scored yourself $3,000 worth of EB vouchers to spend. What will you be spending all your hard earned cash on? Hangie: Which were your favourite cosplay costumes from EB Expo 2012, besides your own costume of course. Hangie: Do you have any plans for future events? Lucy: I sure do! Winning Cosplay Evolved has given me confidence in my costuming abilities, so I’ve decided to enter the Brisbane heat of the Madman National Cosplay Competition next year as Gwendolyn from Odin Sphere, with a puppet Odette. It’s going to be my first time performing a serious skit instead of my normal comedy ones, so I hope that the reception is as positive as the one I got at EB Expo!